On our Facebook page, we are having a Howl-o-ween photo contest. This is for all of you that love to dress your furkids up for Halloween. animals name as the file name so we can use it to title the picture. 30th. On Halloween, we will announce the winner! imaginations and your cameras out for some great photos! Re: PORTLAND, OR: URGENT! Sherwood - 11 yo Doxie Boy Needs New Home/Rescue...PLEASE HELP!! Subject: RE: PORTLAND, OR: URGENT! Sherwood - 11 yo Doxie Boy Needs New Home/Rescue...PLEASE HELP!! Anyone know a status on this little guy? Subject: PORTLAND, OR: URGENT! Sherwood - 11 yo Doxie Boy Needs New Home/Rescue...PLEASE HELP!! 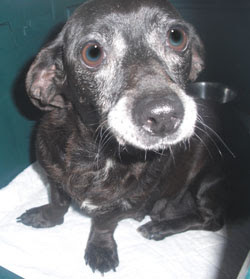 CROSSPOSTING FOR "SHERWOOD", THE 11 YO DOXIE BOY IN NEED****IF YOU CAN HELP, PLEASE CONTACT BARBARA BINGHAM AT seb141@yahoo.com I HAVE CC'D BARBARA ON THIS EMAIL***IF YOU CAN NOT HELP, PLEASE CROSSPOST FAR AND WIDE...LET'S ALL HELP THIS LITTLE SENIOR BOY FIND A NEW HOME/RESCUE....THANK YOU. Thank you very much for spreading the word. Sherwood is so very sweet, a true lap dog and very obedient to simple commands. The head shot makes it look like his eyes are clouded, but they are not. However, I am not confident his vision is good. Physical description, including gender, color, weight, age, type of coat, and any impairments (blind, deaf, etc.). Male, Black and Tan,8lb., 11, short hair, ill health--balding, neglected, terrible breath, impaired vision. Reason for surrender.This dog was my deceased mother's and does not do well with our golden retriever. He has lived at my cousin's since April of 2009. Last night my cousin asked me to take him because he can no longer care for him. Can you provide digital pictures? Pictures should be of the dog only, no other dogs, cats, kids, people, etc. in the picture. Can you provide vet records? I don't know. Is the dog up to date on all immunizations? Rabies? DHPP? Bordetella within the past 6 months? I don't know, probably not. Is the dog leash trained? Is the dog OK traveling in the car? yes on both counts. When was the dog last wormed? When was the dog last treated for fleas? I don't know on worms, last night for fleas. What is the condition of the dog's teeth? Any recent dental work, cleaning? Poor teeth, dental work doubtful. Is the dog kid, cat, other dog friendly? Very friendly just incapable of tolerating a boisterous large dog. Is the dog generally healthy? Does the dog have any health issues? Is the dog on any medications? Not healthy. I don't know. Does the dog have any skin problems? Allergies? Yes, balding. I don't know about allergies. *Please know I have basically rescued this dog out of a bad situation. I do not think he'd eaten for at least a day or two when I got him. His nails are very long, and I do not think I can trim them too well, but I'll try. Welcome to the Animals / Wildlife Newsletter, a twice-weekly newsletter published every Monday and Thursday by About.com's Animals / Wildlife website. For more about animals and wildlife, be sure to stop by the blog, participate in forum discussions, and browse the growing library of animal profiles. The aardvark is the only surviving member of the Orycteropodidae, a family of mammals that once included nearly a dozen different species. The aardvark is one of those quirky mammals that has long tormented taxonomists. At one time, aardvarks were grouped with the edentates (anteaters, tree sloths and armadillos) and pangolins (spiny anteaters). But now, scientists classify aardvarks amongst the ungulates. You may wonder why, after several entries about various hoofed mammals, we arrive suddenly at a group of mammals who not only lack hooves, but don't even have feet. The group in question--the cetaceans (whales, dolphins and porpoises)--are introduced at this point because, despite appearances, they are close kin to the artiodactyls. The Laos Zoo recently celebrated the hatching of twenty critically endangered Siamese crocodiles. The rare crocodiles are threatened by hunting and habitat destruction. Once widespread throughout Southeast Asia and Indonesia, Siamese crocodiles are now restricted to small remnants of their former habitat range. Domestic cattle are quite likely the most familiar members of the Bovidae family, but the bovids (as they are more casually referred to) are more diverse than you might expect. They include some of the fastest and most graceful of all the hoofed mammals and range in size from the royal antelope (which weighs in at just 3 kg) to the gaur (which tips the scales in excess of one ton). You are receiving this newsletter because you subscribed to the About Animals newsletter. If you wish to change your email address or unsubscribe, please click here.